The Festival is one of the best heritage that must be preserved for posterity and should remain a part of our heritage! The word Ginalutan is taken from the native word "Galot" which means Clay Soil. Ginalutan is basically a procedure of transforming galot into a ceramic product. It is not easy to make a ceramic product as it needs a laborious process to get it perfect. This has been one of the source of income for the early inhabitants of the island town of Maripipi. 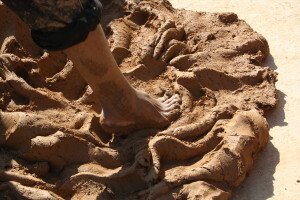 The dance steps are patterned after the movements of the workers who made the ceramics in line with the way they carry the clay in their hands. Likewise, the body gestures and the facial expressions reflect the hardships experience by the workers during the processing of the ceramic products. Props are added to provide colors to the performance and make the "dance steps" more glamorous. 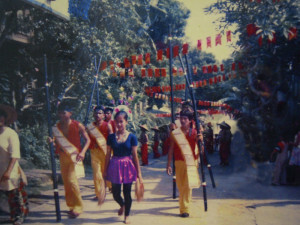 A picture during the early years of a street dance parade before the Ginalutan Festival show! In some years the community would add accompanying activities like the search for Ginalutan Festival Queen in the hopes of increasing the Island's Tourism. Maripipi would enter Ginalutan Festival in the province-wide Festival Competition, which has become the reason for it becoming known among Biliranons. The Festival is one of the best heritage that must be preserved for posterity and should remain a part of our heritage. Today under the current government administration, the Festival is included as one of the community programs - a way of making Maripipi a tourism destination in Biliran Province.